You can find most of these books by using the Amazon.com search box on the left, which I have placed conveniently all over the site. Just copy and paste the title into the search window and Amazon will find it for you. While putting together my History of Greece website I read more than I had in years. Some of these books were very helpful and I have tried to list them in that order. Most of them are easy reading. Some of them are hard to come by but I have included links where you can order, or attempt to locate them using Amazon's Search which I have found to be pretty effective. Most of the historical novels like Mary Renault can be found in the literature section. Matt's Pick! Democracy at Gunpoint was written by Andreas Papandreou while in exile during the Junta. It contains a history of Greece, particularly the relationship with the US. It is a good inside look at Greek politics and history and makes enjoyable reading, not just for historical purposes. For those of you who don't know, Papandreou returned to Greece after the fall of the Junta and became one of the most popular Prime Ministers in Greek History. Matt's Pick! A Concise History of Greece by Richard Clogg is one of the best books on modern Greece and has been translated into a number of languages including Greek and Turkish. It begins with the first stirrings of what was to be the Revolution of 1821 and goes all the way to the present day. Well written and some terrific photos and illustrations. Clogg was one of my main sources and his time-line and biographies were very helpful. The best way I can think of to thank him is to recommend that anyone interested in modern Greek history buy this book. Matt's Pick! Inside Hitler's Greece: The Experience of Occupation 1941-1944 by Mark Mazower is the best book on wartime Greece and maybe the best book on Greek History. I read it twice. I don't even see movies twice. Indispensable for my Greece History web-site with lots of interesting photos it covers all the different aspects of the occupation and paints a very vivid and frightening picture. Matt's Pick! 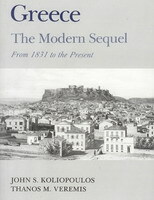 Greece: The Modern Sequel-From 1831 to the Present by John S. Koliopoulos and Thanos M Veremis is written thematically rather than chronologically but it covers all the bases from history, politics, the economy, ideology, culture, music, film, poetry, art and foremost the Greek people themselves. If I had used as much information from this book as I wanted to my History of Greece site would have been five thousand pages long. Ionian Vision: Greece in Asia Minor 1919-1922 by Michael Llewellyn Smith is a very readable history of the dream of a greater Greece in Asia Minor and the tragedy known as the Asia Minor Disaster, the Greek army's defeat at the hands of the Nationalist Turks, the burning of Smyrna and the refugee crisis that changed life in Greece forever. Indispensable reading for anyone who wants to understand 20th century Greece. Sailing the Wine Dark Sea: Why the Greeks Matter by Thomas Cahill was a national bestseller and is considered by many to be the best introduction to classical Greek culture. If you want to know about Plato, Homer, Socrates, Aristotle, the Athenians and the Spartans and all the rest of those guys who had a lot more to do with the way we are today than you might think then this book is required reading. Matt's Pick! Between Heaven and Earth: The Greek Church by John Tomkinson is an introduction to the Greek Orthodox religion, a faith as old as Christianity itself. The book contains a history of the Greek Church from the apostles to the present day as well as the services, festivals, faith, the government and the churches themselves and their furnishings. Hundreds of photos, discussions of the symbolism of icons and a visit to the Monastic Republic of Mount Athos makes this one of the most important books on the Greek Church in the English language. You can order this book directly from the author at anagnosis@anagnosis.gr or use the search box to order from Amazon. Matt's Pick! Traveller's Greece: Memories of an Enchanted Land is a compilation by John L Tomkinson of over one hundred different impressions written by travelers to Greece over the last three centuries. Some of these are very rare works, written by well-known and unknown writers, artists, poets and adventurers including Herman Melville, Edward Lear, Mark Twain, and James Theodore Bent. 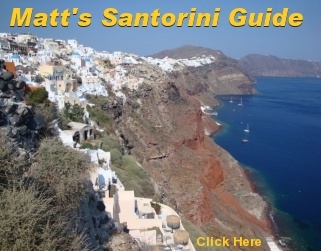 This is an anthology that anyone who loves Greece or travel or history can read from cover to cover and makes an excellent companion for actual traveling. You can order this book directly from the author at anagnosis@anagnosis.gr or use the search box to order from Amazon. Matt's Pick! Smyrna 1922: The Destruction of a City by Marjorie Housepian Dobkin is a the first account of what happened in one of the world's worst human tragedies, the burning of Smyrna and the murder of its Christian population by Mustapha Kemal (Ataturk) while the allies just watched and afterwards took part in a massive cover-up that continues to this day. Using diaries, letters and eye-witness accounts it is a meticulously documented chronicle of the tragedy. A very powerful book that reads like a novel. You can't put it down. The Salonica Bay Murders: Cold War Politics and the Polk Affair by Edmund Keeley, one of the finest writers of modern Greek literature, is a penetrating enquiry into the murder of American Journalist George Polk during the Greek Civil War and the torture and conviction of a leftist journalist that involved Greek, American and British government officials. It is a powerfully written piece of historical detective work that leaves the reader shaking his head in wonder at how far these governments were willing to go in the war against communism. Ships of Mercy reveals the true heroes of Smyrna, later forgotten by history. The book is based on more than 10 years of research by the Papoutsys, who traveled around the globe in their quest to uncover and document the truth about the rescue of hundreds of thousands of Greek refugees from Smyrna in 1922. They discovered a compelling story and found previously unpublished materials. Vintage photographs, exhibits, naval war diaries, and captains� logs appear for the first time in the pages of this volume. �Ships of Mercy� dispels common myths about the evacuation of the refugees and clearly documents the real heroes in this enormous tragedy. Surprising and powerful, it is a story that needs to be told. The Rise and Fall of the Greek Colonels by CM Woodhouse chronicles the last days of civilian rule and follows the April 21 1967 Junta from its beginning to its final collapse in 1974. Analysing international reactions and the United States role in the coup this is about as much detailed information as you can get in one book on this dark period in Greece's history. Woodhouse has written a number of other highly acclaimed books on Greece and is one of the most respected writers of modern Greek history. Not Even My Name by Thea Halo is an important book about the genocide of the Greeks of the Pontos region in eastern Turkey. The book begins in a small Greek village near the Black Sea where life seems idealic. But when Turkish soldiers knock on the villagers doors to tell them they have to leave and can take with them only what they can carry they embark upon a death march that is the end of the 3000 year history of the Pontian Greeks of Turkey. This is a rare first-hand account of the horrors of genocide and a deeply moving portrait of a human being who lives through the nightmare. 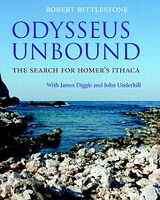 Where is the Ithaca described in such detail in Homer's Odyssey? The mystery has baffled scholars for over two millennia, particularly because Homer's descriptions bear little resemblance to the modern island called Ithaki. This highly illustrated book tells the extraordinary story of the exciting recent discovery of the true location of Homer's Ithaca by following a detective trail of literary, geological and archaeological clues. We can now identify all the places on the island that are mentioned in the epic � even the site of Odysseus' Palace itself. The pages of the Odyssey come alive as we follow its events through a landscape that opens up before our eyes via glorious colour photographs and 3D satellite images. Over a century after Schliemann's discovery of Troy, this breakthrough will revolutionise our understanding of Homer's texts and of our cultural ancestors in Bronze Age Greece. Once upon a time, Europa emerged from the waves at Matala on the back of a bull � the god Zeus in disguise. There, too, the author broke her ankle as she followed Europa to nearby Gortyn � whose famous law code has much to say about women. Europa was the mother of Minos, of the Minoans, (and of the concept of �Europe�). Millennia later, Harriet Boyd was the first woman archaeologist to discover and direct her own dig, at Gournia � a perfect Minoan town. This livret links myth and archaeology by writing and place, but does not neglect the island�s other women. Over the centuries they were subject to numerous changes of overlord � Mycenaean, Roman, Byzantine (twice), Saracen, Venetian, Ottoman, German � but somehow have emerged as Cretans. This is the second in the series of small format books (livrets) OF ISLANDS AND WOMEN. The author�s proposition is this: the most rewarding way for a woman to visit an island is to read books by women who have travelled there, or by or about women who have been part of its history, and to visit the places they describe or where they had their being. Each livret gives hints about which books to read, as well as a flavour of them, and where to go. Itineraries are included, as well as historical background. Most of the information comes from women�s writing or the experiences of the author and her husband. For ordering info e-mail holobooks@yahoo.co.uk or use the search box to order from Amazon. A War Like No Other: One of the most provocative military historians, Victor Davis Hanson has given us painstakingly researched and pathbreaking accounts of wars ranging from classical antiquity to the twenty-first century. Now he juxtaposes an ancient conflict with our most urgent modern concerns to create his most engrossing work to date, A War Like No Other. Over the course of a generation, the Hellenic city-states of Athens and Sparta fought a bloody conflict that resulted in the collapse of Athens and the end of its golden age. 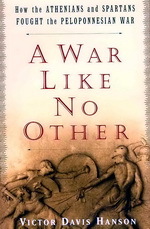 Thucydides wrote the standard history of the Peloponnesian War, which has given readers throughout the ages a vivid and authoritative narrative. But Hanson offers readers something new: a complete chronological account that reflects the political background of the time, the strategic thinking of the combatants, the misery of battle in multifaceted theaters, and important insight into how these events echo in the present. Hanson compellingly portrays the ways Athens and Sparta fought on land and sea, in city and countryside, and details their employment of the full scope of conventional and nonconventional tactics, from sieges to targeted assassinations, torture, and terrorism. He also assesses the crucial roles played by warriors such as Pericles and Lysander, artists, among them Aristophanes, and thinkers including Sophocles and Plato. Hanson's perceptive analysis of events and personalities raises many thought-provoking questions: Were Athens and Sparta like America and Russia, two superpowers battling to the death? Is the Peloponnesian War echoed in the endless, frustrating conflicts of Vietnam, Northern Ireland, and the current Middle East? Or was it morelike America's own Civil War, a brutal rift that rent the fabric of a glorious society, or even this century's " red state-- blue state" schism between liberals and conservatives, a cultural war that manifestly controls military policies? Hanson daringly brings the facts to life and unearths the often surprising ways in which the past informs the present. Brilliantly researched, dynamically written, A War Like No Other is like no other history of this important war. Z by Vasslis Vassilikos is based on the political assassination of celebrated Greek patriot, member of parliament and pacifist Grigoris Lambrakis in 1963 and the investigation by a courageous attorney who follows the trail to the highest level of the Greek police and government. This is a fascinating novel that was banned in Greece during the Junta. It was later made into a movie by Costa-Gavras that is still considered one of the best political thrillers ever made. The murder of Lambrakis was one of the most important events in the history of modern Greece. The Greek Tragedy by Constantine Tsoucalas was one of the first books I ever read on modern Greek History. Published in 1969 the book is a history of modern Greece written during the Junta by a lawyer and sociologist living in Paris. It is able to portray the anguish of the military dictatorship and provides an explanation in the context of Greek History. When I read this book in 1974 the Junta was still in power. It was the beginning of my interest in modern Greek history. Amazingly it is still available at Amazon. 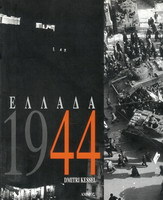 Ellada 1944 by photo-journalist Dmitri Kessel is a book of photographs that begin with the end of the Nazi occupation and continues with the massacre of leftist demonstrators in Syntagma square and through the first year of the Greek Civil War. There are portraits of leaders including Aris Velouchiotis, Giorgios Papandreou, Archbishop Damaskinos, Winston Churchill and photos of Athens street scenes, British troops fighting from the Acropolis and unbelievably sad photos of a truly tragic period. Out of print and hard to find. 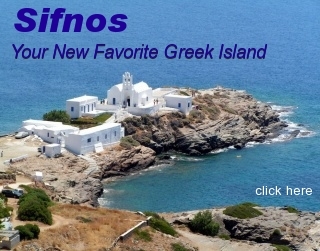 Try nikos@ammosbooks.gr or use the search box to order from Amazon. 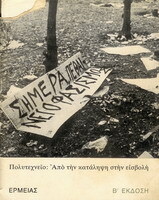 Today Fascism Dies: The Politechnic- From the Occupation to the Invasion is a book of photos published in 1974 which is almost a minute to minute photographic account of the student demonstrations at the Politechnic University of Athens leading up to the Junta crushing the rebellion when a tank crashes through the gates of the school. With hundreds of photos from Wednesday Nov. 14th to Monday Nov. 19th this book is a collectors item. Where can you get it? Probably nowhere but you may get lucky if you check every used bookstore in the free world. After the War Was Over: Reconstructing the Family, Nation and State in Greece, 1943-1960 is a collection of essays edited by Mark Mazower that discusses the tragedy of Greece in the war and postwar years, a period when the country grappled with foreign occupation, civil conflict and was the front line in the Cold War. With chapters on the Jewish survivors of Thessaloniki, the punishment of collaborators, leftist violence, the children who grew up during the war and other subjects make this an important contribution to understanding this period and the Greece of today. Heirs of the Greek Catastrophe : The Social Life of Asia Minor Refugees in Pireaus by Renee Hirschon follows a large group of the one million Christians who were expelled from Turkey after the defeat of the Greek army and burning of Smyrna, to the urban quarter of Kokkinia in Pireaus. This is one of the few in-depth studies of a refugee community and how the Greeks of Asia Minor, though they have lived in Athens for three quarters of a century, still maintain a separate sense of identity from the mainland Greeks. Well written and fascinating. Athens: From Ancient Ideal to Modern City by Robin Waterfield is an epic story that begins in the Classical period and follows the transformation of Athens through the Macedonian, Roman, Byzantine, Frankish and Ottoman periods all the way to the present day. It is a fascinating look at an extraordinary city and is a valuable tool in understanding the Athens of today. Robin Waterfield has translated a number of the ancient Greek classics including Plato, Herodotus, Euripides and Plutarch. A Short History of Byzantium by John Julius Norwich is actually an adaptation of his massive three volume History of Byzantium. Beginning in 330 AD when Constantine the Great makes Christianity the religion of the realm and transfers the capital to the city of Byzantium which becomes Constantinople the book follows eleven centuries of warfare, politics, theology and art, encountering mystics, philosophers, eunuchs, barbarians and saints. One of the best historical narratives ever written and certainly a must-read for anyone interested in the Byzantine empire or Christianity for that matter. The Greeks: The Land and People Since the War by James Pettifer is a classic survey of the roots of Greek social, economic, and political realities and a useful introduction to anyone who wants to go beyond the Greek stereotypes. With chapters on PASOK, tourism, archaeology, language, food, the family, the environment, Albanians and other minorities it is the kind of book that might piss you off if you are Greek, if you did not agree with most of what he writes. Pettifer has the classic love/hate relationship with Greece. If you do too you may want to read it. Inventing Paradise by Edmund Keeley is part cultural history, part literary criticism, part personal memoir that captures modern Greece before, during and after the Second World War. In it we come face to face with such literary heroes as Henry Miller, Lawrence Durrell, George Seferis and the Colossus of Marousi himself , George Katsimbalis. These characters and others spend evenings in tavernas, and explore Greece in an extraordinary time. Perhaps Keeley's best work and a must for any fans of these writers or people who wished they could have experienced Greece in a romantic time on the eve of catastrophe. Lord Elgin and the Marbles: The Controversial History of the Parthenon Sculptures by William St. Clair is an authoritative account of the extraordinary circumstances in which the Elgin Marbles were acquired from the Turks during their occupation of Greece and the tremendous impact they had on the appreciation of Greek art all over Europe. I bought this book in the British Museum when I went to see the Parthenon Marbles and bought the book because it seemed like the responsible thing to do if I was going to write about them. I expected it to be a chore which it was not. This is enjoyable reading and a window not just on Lord Elgin and his motives but Greece and London during this period. Road to Rembetika: Music of a Greek Sub-Culture, Songs of Love, Sorrow and Hashish by Gail Holst is the best book on the Greek Urban Blues in English and as you can tell by state of the cover my copy has seen a lot of use. Loaded with historic photos, historical and biographical information on the musicians and Greek society from the twenties to the fifties, translated lyrics and lots more this book helped me appreciate rembetika music enough to listen to it for the rest of my life. Songs of the Greek Underworld: The Rebetika Tradition is Ed Emery's translation of the Elias Petropoulos book. Petropoulos is a free-thinking poet, collector of songs and an expert in the ways of the Greeks who was put in prison by the Greek Junta for his massive book Rembetika Tragoudia. Songs of the Greek Underworld explains the history of the music, breaks down the rhythms and metric patterns and includes the lyrics, music and a number of photographs and drawings. Until Emery finishes the translation of Rembetika Tragoudia this book should hold you over. Journal of Resistance by Mikis Theodorakis was published in France in 1971 while the Junta was still in power in Greece. Greece's most famous composer describes his three year ordeal from going underground to his arrest, imprisonment, internal exile and internment to the negotiations that enabled him to leave Greece for France. Theodorakis has always embraced just causes and has shown great courage and patriotism. The book is a journal of events and his thoughts during this period of the life of a man who is a living symbol of resistance to tyranny. House Arrest by Helen Vlachos is another book about the events of 1967, written by the daughter of one of Greece's best known journalists George Vlachos. Helen was the publisher of the daily Kathimerini and the only newspaper owner who refused to publish under censorship. Because of this she was imprisoned by the dictatorship until she was able to escape to England where she published the book in 1970. The book is about her experience under the junta but also contains recollections of the occupation and the civil war. 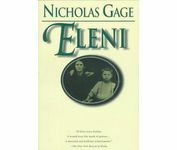 Eleni by Nicholas Gage is a personal history and the story of the heroism of Gage's mother who sacrificed her life to save her children during the civil war when their village of Lia, near the Albanian border, was under the control of the communists. If Eleni is not the best selling Greek book after the Illiad and the Odyssey I would be surprised. It is a facinating book, written with passion and love and able to evoke these emotions in the reader. The movie I thought was disappointing and even if you have seen it and feel like you know the story I still urge you to read this book. It is very powerful and if you are not familiar with this period of Greek history, a real eye-opener. North of Ithaka by Eleni Gage should probably be in another section other than history but because it is in a way a continuation of her father Nicholas Gage's book, I have it listed here. Its about Eleni's return to the village where her grandmother was murdered during the Greek civil war and her efforts to restore the house. "Part personal memoir, do-it-yourself-manual, historical novel, family saga, and tourist guide, North of Ithaka tells of Gage's attempt to put her cultural confusion to rest by exchanging the skyscrapers of New York for the mountaintops of her ancestral village." Athens-Auschwitz by Errikos Sevillias was written by a survivor of the Nazi death camps and found among his papers when he was struck and killed by a motorcycle in 1974. The book is one of the most heart rendering and enlightening that I have ever read. It was translated by and features an introduction by Nikos Stavroulakis, respected author and founder of the Jewish Museum of Athens. The introduction is a historical outline of the Jews in Greece. Difficult to find. Life in the Tombs by Stratis Myrivilis is a Greek masterpiece that has been translated into a dozen different languages, only recently into English. This is a realistic account of trench warfare on the Macedonian Front during the First World War written in journal form by a young intellectual who in the spirit of patriotism and idealism volunteers to serve on the side of Venizelos and the allies. This book was banned by the Metaxas regime and during the Nazi occupation. The Trial of Socrates by I.F. Stone is a classic by one of America's most well-known and respected journalists. The book is a fascinating examination of Athenian society and the trial that led to the death of one of the most brilliant men who ever lived. Stone argues that while the Athenian verdict cannot be defended, it can be understood: Socrates was an anti-democratic reactionary whose philosophy posed a genuine threat to liberal ideals. Whether you agree or not Stone's book is an excellent work to read to prepare you for reading Plato. The Last Days of Socrates by Plato contains the four works Euthyphro, The Apology, Crito, and Phaedro which describe the trial and condemnation of Socrates on charges of heresy and corrupting the youth of Athens in 399 BC. Plato was probably the most important thinker in western history and the death of his teacher, Socrates convinced him that until philosophers became rulers and rulers became philosophers, there was no hope of curing the ills of society. The Histories by Herodotus was written by the 'father of history' "to prevent the traces of human events from being erased by time". The story centers on the early days of the Greek city-states and their war against the invading army of the Persian empire at the beginning of the 5th Century BC. In a battle that the powerful Persian army vastly outnumbered them, the Greeks were victorious and thus began the Golden Age of Athens. The book was finished in 425 BC and is a detailed description of life, people, animals, plants and pretty much everything. The book was translated by Robin Waterfield who has translated many of the ancient classics and also written Athens: A History. The Peloponnesian War by Donald Kagan is an account of the struggle between Athens and Sparta and their allies which led to the collapse of the Athenian society that had been the fountainhead of western thought and culture. It was a period of enormous destruction and loss of life which was written of by Thucydides who was a contemporary but died before the war ended. Kagan, who has also written a four volume version on this subject which is considered the leading scholarly work, paints a picture of the decline of ancient Greece that is frightening in its similarities to our times. Good book to have by the side of your bed for when you wake up in the middle of the night and can't get back to sleep. The Cretan Runner by George Psychoundakis is the author's story of his war-time work in the Cretan resistance against the Germans. His journeys involved smuggling arms and explosives, carrying vital messages, guiding allied soldiers, agents or commandos through occupied Crete, all told with humor and humanity. The book is translated from Greek by Patrick Leigh Fermor and includes a 40 page introduction by the greatest of the philhellenic writers. This is an exceptional book and a remarkable story. Greece and Crete 1941 by Christopher Buckley is one of six books from The Second World War, 1939-1945: A Short Military History Series in which writers were commissioned to document events of the war and present them in a readable style for the general public. This book was originally published towards the end of the war and reprinted by the Efstathiadis Group in Athens. It tells the story of what might have been the most courageous stand by the allies, the defense of Crete and its fall to the Germans. Plato for Beginners by Robert Cavalier introduces readers to the philosopher who helped shape the way we think about the world. It includes a look at Socrates whose martyrdom led Plato to form a new system of knowledge based on reason. In this 'documentary comic book' Plato's life unfolds in a lively and humorous way, teaching the reader the classic dialogues of the greatest of the Greek philosophers in a way that is fun for any age. Introducing Aristotle by Ropert Woodfin and Judy Groves guides the reader through an explosion of theories from systematic logic to the earliest rules of science. Aristotle created or influenced almost every 'ology' in our western culture today and was a big influence on Islamic philosophy and medieval scholasticism. Like the For Beginners series, Introducing Aristotle is a documentary in comic book form and gives the reader a whole lot of knowledge in an extremely palatable way.